because it could happen to you. No one thinks it could happen...until it does. This post has been sitting in my draft folder for the past 3 years, but after hearing about Kim Kardashian being held up at gunpoint yesterday and robbed of her jewelry, I had to post this. Regardless of your feelings about her, she is a person. And what happened was a scary situation. An extreme one, but it prompted me to share my tips with you. A few years ago, at a special screening for influencers, oddly enough, I was watching the movie The Bling Ring. What struck me and initially inspired this post was how the robbers found out the celebs weren't at home via social media. That's how they knew when to go over and rob. That scared the dang crap out of me and made me reevaluate how I approach social media as a blogger. Make sure your location is off when you post on sites like Twitter and Facebook or Instagram. I see this all the time on a simple status--the map of where you live (or close to it) comes right up. You never know. Is your phone tagging the location of your pictures? Snapchat is great, right? The REAL you, no filters or fake backdrops necessary. It's a way to share your life in the moment. But is sharing exactly where you are at any given moment a great idea? Not all the time. If I'm at a blogger event or on vacation, I'll post "in the moment." Sometimes, though, I will post a Snapchat after I've left a location. It all depends. Did you know one of the top passwords people use is the name of their pet? It's something to consider--not using anything identifiable like a pet or child's name, if those are commonly discussed on your blog, as a password. This one is personal--whether to post about your kids or not/share their pics/their names. For many of you, as mommy bloggers, the kids are definitely a part of your blog. Some use fake names or nicknames (really cheesy nicknames sometimes get on my nerves to be honest) or just the use the age. I work as a nanny and don't share anything personal about the kids on my blog. As far as the kids in my life, like nieces and nephews, I never share anything identifying schools, sports teams they play for, or other specific info about them. I always have permission from the parents first before their pics are on my blog or social media. I have heard situations where pictures from blogs of kids were stolen by individuals and passed off as if the kids were their kids. I recall a situation where a person had an Instagram full of pics that were not their kids or grandkids, but they said they were. One even said the pics were of her dead children in order to gain sympathy. I'll say it again: people. are. crazy. The mostly-defunct blog, Young House Love, used to never give away that they were on vacation until they were back from it. No Instagram pics while they were there--those were always posted after the fact. I've never gone that route (you will definitely be seeing Disneyland pics coming in a few weeks) but I don't really mention it until after I've left. I don't share my exact schedule when I'm traveling for vacation (ex: "I'll be gone on the 3rd but back on the 11th!"). Sometimes I have a house sitter, but I always make sure the security guard that lives on site knows to patrol where I live--that's not really for being a blogger, though, just being a safe human being. Again, something to consider. As I've said before, I keep in mind what I post. Avoid those details that might give away where you live or work (address). It's easy since I live in a big city, but I'm still smart about it--my address number isn't in a pic. I don't blog about my neighborhood haunts. I live near identifiable places but I never share where. I don't Snapchat me inside of my local Starbucks that I go to daily at 9 am (I am giving an example). You won't hear about Instagramming myself alone at night leaving a location. I keep that info to myself. Not everything has to be documented online. 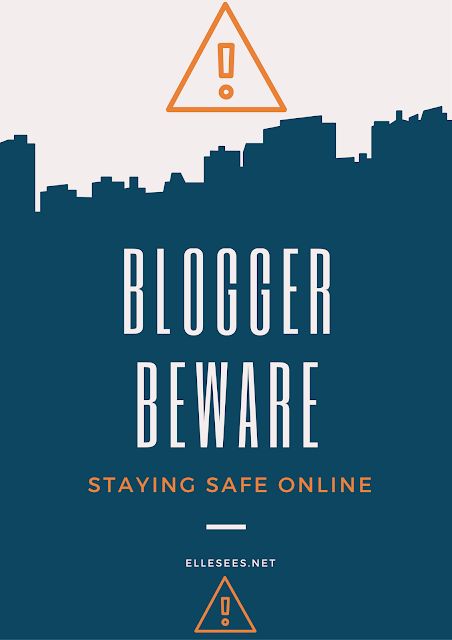 Homes make up the content of many blogs, so be careful about what you share here--to circle back to the Kim Kardashian robbery, supposedly she had Snaps of her jewelry, later stolen by robbers. Another example--I recall a blogger sharing how she organized her home, including her checkbook and its exact location! The biggest takeaway from this is to be aware of what you are posting. I had someone once figure out where I used to live--that was from me being lazy and not following the tips above. It scared me to death, so now I do a double check before I post anything, anywhere. Better to be safe, than sorry. What tip do you have for staying safe online as a blogger? My annual purchasing of mums for fall happened recently. Loving the cheery yellow flowers as part of my fall decor. I'm glad you posted this. People are crazy and you never know. I've always had the location turned off on my photos on my phone but need to better at reviewing background details before I post. It is really scary to thin how much information you can gain from the internet. It always drives me crazy when my husband posts that he is out of town for work! I will definitely be more careful when posting to Social Media. This is a great post. Some of these didn't even enter my head! What happened to Kim was definitely a wake up call for a lot of people I think! These are great tips. This is something that we bloggers must take seriously. Thanks for the wake up call. Shew this is something I take really seriously, myblog has been hacked before its no joke, what a freaking mission... so I am super careful about everthing and I also do social media after an event or even having lunch I do it after..you have to be so careful! So thank you hun for this post, EVERY blogger or social media fanatic needs to know this.. So, so true! Social media puts so much pressure on sharing everything right when you're doing it! These are all very true things to consider when you are online a lot. People are crazy out here and you have to be careful to protect yourself and family. Thanks for sharing Elle. You have to be SO AWARE of what you post. Cause you are right - PEOPLE ARE CRAZYYYYYYY!!!! I never ever put when I'm home alone either online. Ricky hates even when I post when we're in Nashville with the grandbabies but I CANT WAIT to post pictures. I'm so glad for our security cameras though. This is a concern of mine and sometimes I do wonder if we share too much, especially with SnapChat and IG Stories so big now. We have an alarm on our home, which helps... but, it's still scary to think people can know when you're not home via SnapChat. Or, if you're on vacation or even if you run on a trail the same day/time everyday. Yikes. Def. something to think about! I had a scary situation recently that freaked the crap out of me. I went out with my gf's dancing after a major football game where we won. I had someone send me a message the next day saying he saw me at the bar and stood beside me, and that he wanted me. I blocked him but he kept coming back with new profiles. I finally disabled that account, changed my name on my fb so that it doesn't show my last name. I didn't even "check in" to that bar either. People are crazy. I am glad I have a roommate and a big dog who would never let someone into my house. This is something my husband and I talked a lot about before I shared my last name, the city we live in, or posting about travel on my blog. After a few years we eventually came to a place where we decided we were okay with sharing that stuff publicly. I'm honestly not sure what we'll do when we have kids, though. That's a whole other ball game. I think just being aware and thinking this stuff out is a good start! Thanks for sharing! This is definitely something that I think about a lot, and I always wonder if i share too much. These are really great tips and things to consider! I didn't think about the vacation thing until a blogger a while back came back from vacation and THEN talked about it. Since then, I don't post that I'm going somewhere. And I try to keep details about my exact location to a minimum! These safety tips are soooo key- whenever I'm traveling + want to Insta + Snap while on the trip, I ALWAYS make sure I have a house sitter! You can't be too careful! It's such a scary world now especially with social media. Great tip about turning off location. This is a great post not just for bloggers but for anyone using social media in general! People are straight up crazy, you are right there!!! I wont post vacation photos or anything until I am already back from it and usually don't announce the exact dates I am gone either. Right now I am certainly considering how much of my kid I am going to be willing to share online. I have debated creating a separate instagram for just family and close friends if I decide to share her pictures there past maybe one or two random ones. I have gone back and forth on whether I will be sharing her name on my blog or not. It is so hard to make these kind of decisions! This is why I've pretty much stopped posting any pictures, etc of my daughter online at all. With kid pictures it gets even worse than what you touched on, I've heard some horror stories. So she's not part of my online presence. It horrifies me that some people still share pictures of their kids in the bath, on the potty, etc. Don't do that, not even on a locked down facebook, just don't do it! The world is such a scary place sometimes. Thank you for posting this! I normally will post when we're out of town because I'm a travel blogger, but one thing I have changed recently is that I'll untag my Instagram pictures that put a geotag on them even though I didn't pick a location. My friend told me about it and a lot of the geotags had picked up my actual address! I quickly deleted them, but man did that freak me out because like what you said, people are crazy! I think this is such a great reminder post. All too often we can become comfortable in the blogging community because there are such supportive people. It can lull you into feeling safe. I really appreciate all these tips! And the location thing on your phone especially! I turned that off years ago as a mother. It's scary! It definitely is scary business - people are really crazy. This is so timely considering what just happened. Thanks for the reminder and tips. Social media is fun until something happens and we should all be mindful of how much we share online. People are definitely crazy and I think everyone could take something from this blog post. I hardly ever use locations, maybe once in a while and on my personal Facebook page. That's scary that people can find out who you family members are, etc just from following you. And I can't believe someone found out where you lived! This is such a good reminder. I do a lot of these mainly do to where I work. Along with my husband job. I have always been extra careful about what I post online and what I share. I do share little tyke's pictures but always a small part of him, never the full picture. My Facebook account is locked down and it's tough for anyone to find me because I had a horrid experience of an online stalker. It was so bad to the point I had to change job because he was sending emails to my superiors. It's not something that I would wish on anyone. This really is something to think about anymore because you just never know about people!! It's hard having social media and wanting to share, but when is it too much sharing? The Kim K story scared me to death. Like you said, regardless of your opinion of her, that's a horrible situation to be in. Celebrity or not, she's a person and a mother and I know she had to be terrified. This a post everyone needs to see. You brought up some great points that most people would just skip over. Thank you for sharing! I actually don't do all of these, so I will be making some changes. There are some crazies out there! Yes to all of these! I am shocked at how willing a lot of bloggers give out information and they don't realize it. And where I live, it's so easy to be found as it's not a big city, so yup, I defo don't blog about places I frequent on a regular basis..! Thanks for reminding us all!! It's definitely scary and I think you are right about everything you talked about. Well I chose not to have Instagram or Snapchat, on facebook I don't show where I am, or Twitter - where I post 2 or 3 times a week only. On vacations I always share after I come back, because I seldom use computers during holidays. I try not to post about things that I cannot even talk on the comment now, so that I am safer. I know some people are thirsty to show off their wealth - that obviously has to do with low self-esteem; I find it crazy in a world the way it is now and I prefer to be safe. It is definitely a very good post! So much truth to how scary it is out there, and social media and the internet has only added fuel to the fire that are the crazies. I've always been viligent about not sharing my husband's name and I will do a "she's here" post about baby girl whenever she decides to arrive in the coming days/weeks, but after that she's going to stay off the blog and public social media platforms. i agree - i'm not a kardashian fan but she is still a person and that is terrifying. i do the same thing with posting after i've left where i am. i see some things people post and i'm just like.... the world is scary yo! be careful. seriously. All good points. I've never had the "location" thing turned on, and I've always been paranoid about the kids thing. It took a number of years before I started sharing pictures even on private accounts. You can't be too careful. We live in a scary world...my parents always say that times have changed so much because of social media. And it's so true. Although I'm a nobody online, I still try my best to not share where I live...or anything else really. You will NEVER find me posting pictures of my kids (if we ever have any) that's something my husband and I have agree on. No kids on social media. Not even my personal accounts. Thanks for sharing these great tips, Elle! People are crazy! It can be hard to figure out how to stay safe online, but your tips are great. I usually wait to post pics until after I leave a place. So many of these are things that I know, but haven't really thought about lately. I need to be more careful about things that automatically post a location--I want to have control over that for sure! Thanks for sharing this Elle. These are such good tips, and they are so important - especially as you said for people who have kids. I use nicknames (sorry!!) when I refer to the boys on the blog and I'll happily share Cooper's cute fluffy face but never the boys. I was brought up to be very wary of what I share online and so I try to be as careful as possible, but it only takes one thing. Especially now! The first blog I had someone tracked down my ebay account (they could then bid on my auction and get my home address....) and my blog and my email address. It was easy to toss everything then and create new things online but it's harder to do now with everything so interconnected. My number one pet peeve is people sharing their birthday and their age - date of birth can then be calculated and that's a security question! Sometimes I dislike being so vague about who's birthday I'm celebrating and what age they are turning but it's better to be safe than sorry! Hope you're having a fantastic week :) Thank you for sharing this, I hope people read it and consider what they share! Great tips, but it's becoming harder and harder to apply them 100% of the time these days. People, including myself, often use social media to communicate with their friends. Just the other day I started discussing my next vacations with a buddy, it felt so natural... luckily he is also prudent and told me to delete th tweets that mentioned the dates. This is a great post!! What happened to her was so scary and when we share too much it can happen to any of us. It's easy to think of everything we post as so innocent but we can innocently share way too much if we're not careful. I definitely have my location turned off on Facebook. I use general locations on Instagram, like Duluth or Atlanta, plus I usually post to Instagram after-the-fact. I don't mind sharing when I'll be on vacation, but only a handful of even my real-life friends/family know where Dan and I live. I'm very careful about the pictures I share of my nephew. I've only shared two on my blog, and neither show his face. Whoa . . . lots of comments because this is such a scary subject. It's so hard to know when it's too much or just enough posting about your life. But I've tried very hard to always block out where we live details, cover up shirts that say schools, never say actual birthdays on the blog, etc. Feel free to point something out if you ever read it and think, bad idea. Sometimes we all just forget or don't realize what we did. But seriously, loved this reminder and I think I'll save it to re-read in a few months to jog my memory. Scary stuff people figured out where you live . . . I suppose that's one thing about being a small blog myself . . . nobody cares!!! Ha! Happy Monday girl! GREAT post! You are really good about being safe - I like that you don't ever give any specific details about things like vacation dates, etc. Now that I'm not blogging, my social media is all private and I know every person who follows me. Even still, I usually don't post anything on Instagram with a location until I've left. Just seems better to be safe than sorry!